Detail of one of the calderas, or collapsed volcanic craters, on Jupiter's moon Io, is seen in these images acquired on February 22, 2000by NASA's Galileo spacecraft. Taken from a distance of 700 to 800 kilometers (roughly 400 to 500 miles). 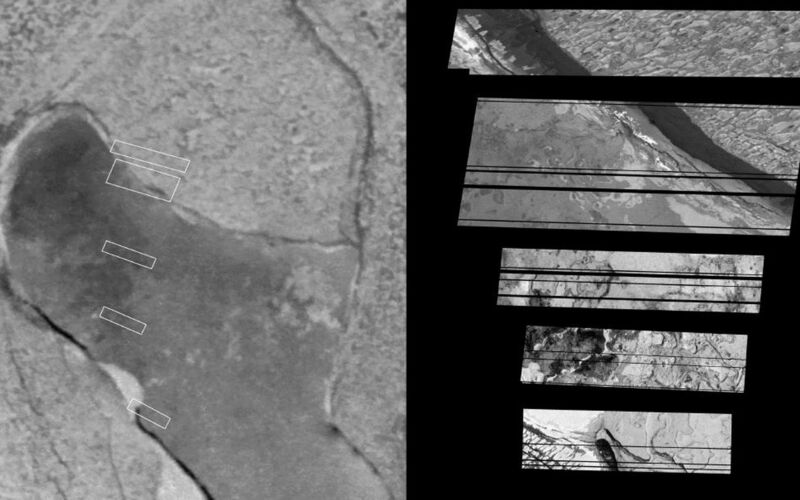 The five partial images on the right comprise all of the data that could be returned from an eight-image mosaic. These are the highest resolution images of lava flows ever obtained from Io. 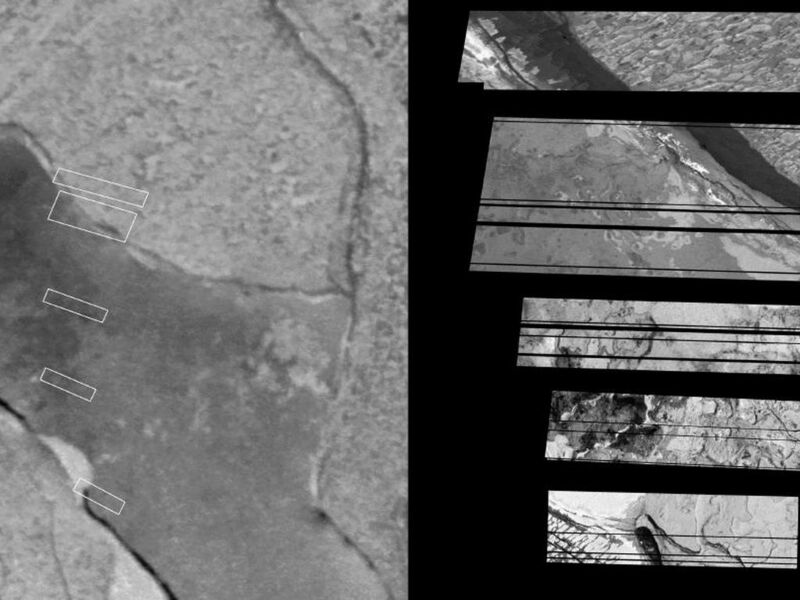 The resolution of the close-up images varies from 7 to 8 meters (about 23 to 26 feet) per picture element. 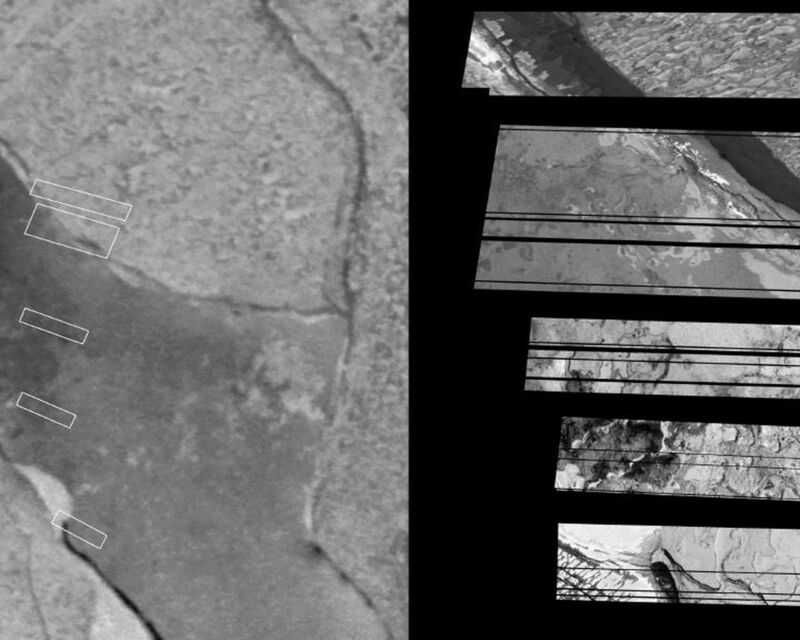 The boxes in the image to the left are approximate locations of the five partial images. 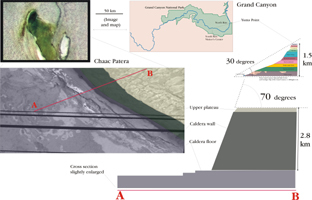 They are shown superimposed on a lower resolution image of the entire Chaac caldera. The high-resolution snapshots highlight areas from both the southern and northern rims as well as areas on the floor of the caldera. They reveal fascinating similarities and differences between calderas on Io and Earth. Most puzzling is the texture of the material above the caldera rim. The plains surrounding Chaac are covered with alternating dark and light patches. The process that forms this surface is a complete mystery. 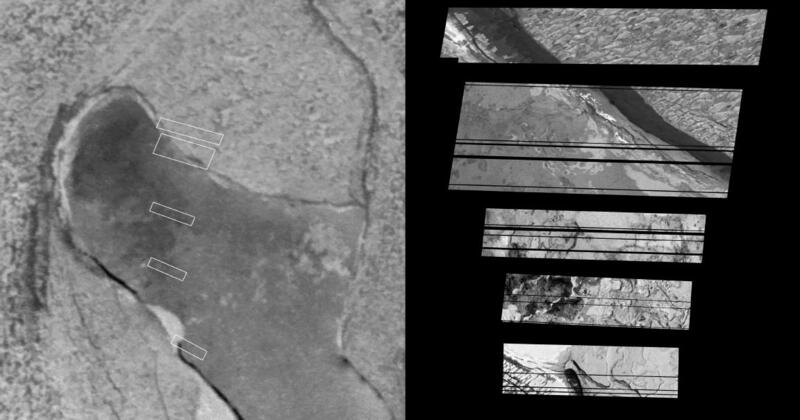 By comparison, scientists analyzing the images say the floor of the caldera is amazingly familiar. The interwoven domes and pits form a surface essentially identical to many terrestrial calderas that erupt fluid lavas. For example, the similarity to the caldera on top of the Kilauea Volcano in Hawaii is striking. The southernmost Chaac image shows several raised plateaus and a deep, dark pit about 400 meters (about 440 yards) across. Although the Kilauea caldera is 10 times smaller than the Chaac caldera, the 1959 Kilauea eruption formed similar features to Chaac when a small volcanic crater was filled by erupting lava. The Hawaiian lava formed a pond that crusted over and then partially drained back down into the ground. Pieces of the pond crust that were left behind formed a perched plateau, and the hole the lava drained back into formed a deep pit. Scientists presume the same thing happened at Chaac in the recent past. The high-resolution images were taken at a distance of about 700-800 kilometers (400-500 miles) and are centered around 12 degrees north latitude and 158 degrees west longitude. North is to the top and the sun illuminates the surface from the right. The lower resolution image was also taken on February 22, 2000 but from a distance of 18,800 kilometers (11,700 miles) from Io. The image is centered at 11.6 degrees north latitude and 157.7 degrees west longitude. North is to the top and the Sun illuminates the surface from the left. The Jet Propulsion Laboratory, Pasadena, Calif., manages the mission for NASA's Office of Space Science, Washington, D.C. JPL is a division of the California Institute of Technology, Pasadena, Calif.